1Postgraduate Program in Environmental Physics, Physics Institute, Federal University of Mato Grosso (UFMT), Cuiaba, Brazil; 2Laboratory of Conservation Biology, Federal Institute of Mato Grosso, Cuiaba, Brazil. Brazilian Pantanal is one of the largest floodplains of the Earth with 138,183 km2, and 35% of its area is in Mato Grosso state. Paraguay River crosses the Pantanal from North to South and becomes larger and formsa complex river system . The climate is characterized by periods of floods and droughts that alternate throughout the year, allowing the formation of monodominants stands. At the other extreme, frequent drought cause local water stress in plants which regulates its phenology and mass production . The soil temperature is a factor which controls microclimatic seed germination, rate and duration of plant growth and development, nutrient uptake, water and gas distribution in soil as well as the growth and development of microorganisms . Considering each soil type has unique characteristics, it is necessary to identify, for each particular situation, their thermal properties, which are the result of a number of factors, including its texture and chemical composition. Regular observations of soil temperature at different depths allow the knowledge of their thermal profile variation and important soil properties such as soil thermal conductivity and soil thermal diffusivity . These soil thermal properties, especially the soil thermal diffusivity, are used in studies of soil temperature simulation at different depths . Soil thermal diffusivity is an important parameter that affects soil temperature distribution and soil heat flux density . Furthermore, it is a property that informs the soil heating speed that relate with soil thermal conductivity and soil thermal capacity . The estimation of soil thermal diffusivity can be determined by various methods, such as amplitude, phase, arctangent, logarithmic, numeric and harmonic, which utilize soil profile temperature measurements . These methods are based on the soil heat transfer theory, using analytical or numerical solutions of the heat conduction equation described as uniform and homogeneous soil . Therefore, the objective of this study was to evaluate different estimates of soil thermal diffusivity of a Gleyic Solonetz soil in a mono dominant forest in the Brazilian Pantanal. The experiment was conducted in an experimental area of Reserva Particular do Patrimônio Natural-RPPN SESC Pantanal (16˚39'50''S; 56˚47'50''W; 120 m of altitude) in the Barão de Melgaço, Mato Grosso, Brazil between October 2008 to February 2009, during the period when there was no flooding, which occurred in March 2009. This area is composed mainly of Vochysiadivergens Pohl, known locally as cambarazal, with 28 - 30 m canopy heights, forming a continuous band of approximately 25 km long and 4 km wide, parallel to the Cuiabáriver. The annual average temperature is between 24.9˚C to 25.4˚C, annual rainfall is on average 1400 mm with a pronounced dry season extending from May through September . The topography of the floodplain is virtually flat, causing extensive flooding during the wet season. Wet-season floods are 1 to 2 m in depth, but during the dry season many of the floodplain lakes become disconnected from the river channel as the floodwater recedes . The soil type of the study site is classified as a Gleyic Solonetz soil . Precipitation data were obtained daily by personnel of RPPN SESC-Pantanal from a manual rainfall gauge located 10 km NW of experimental area. Soil temperature was measured at 1, 3, 7, 15 and 30 cm depth, using five thermistors (108-L, Campbell Scientific, Inc., Logan, Utah, USA). These depths were chosen due the higher soil temperature amplitude from surface to 7 cm depth and practically null at 30 cm depth. Volumetric soil water content was measured with two time domain reflectometer (CS-615, Campbell Scientific, Inc., Logan, Utah, USA) at 5 and 25 cm depth. The sensors which produced signals that were stored by a datalogger (model CR10-X; Campbell Scientific, Logan, UT). The one-dimensional heat conduction in soil is given by Equation (1). where T is the soil temperature, t is the time and z is the depth. Due to the partitioning of a not uniform soil in soil layers with uniform composition and texture, the Equation (1) can be rewritten to Equation (2). where Kj = (k/C)j is the apparent soil thermal diffusivity of j layer, delineated by zj − 1 and zj + 1, with j = 1, 2,···m the number of layers, not necessarily same thicknesses. The apparent soil thermal diffusivity can be obtained by the soil temperature measurements replaced in expression of analytical solutions of Equation (2). Several methods have been used to solving this Equation . In this study the soil thermal diffusivity was estimated between 0.01 and 0.03 m, 0.01 and 0.07 m and 0.01 and 0.15 m depth by the amplitude, logarithmic, phase and arctangent methods. 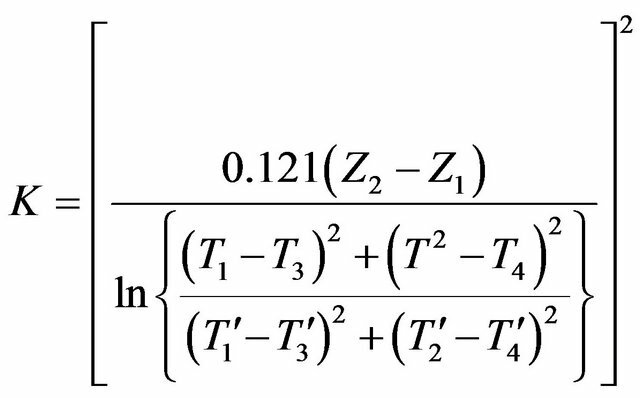 The daily soil thermal diffusivity K estimated by amplitude method  is shown in Equation (3). where is the angular velocity of the Earth and A1 and A2 are the temperature amplitudes in the Z1 and Z2 depths, respectively. The daily estimation of soil thermal diffusivity by the phase method was obtained by the Equation (4). where Z1 and Z2 are the soil depths and Δt = t2 − t1, where Δt is the time interval between t1 and t2, which are the instant when the temperature is maximum in Z1 and Z2. The soil temperature at the surface can be described by a sines series. The values of soil temperature measured at a specific depth can be adjusted to Fourier series , given by Equation (5). where is the average temperature in considered time interval, M is the number of harmonics, An and Bn are their amplitudes, n is the number of observations, is the angular frequency and t is the time. 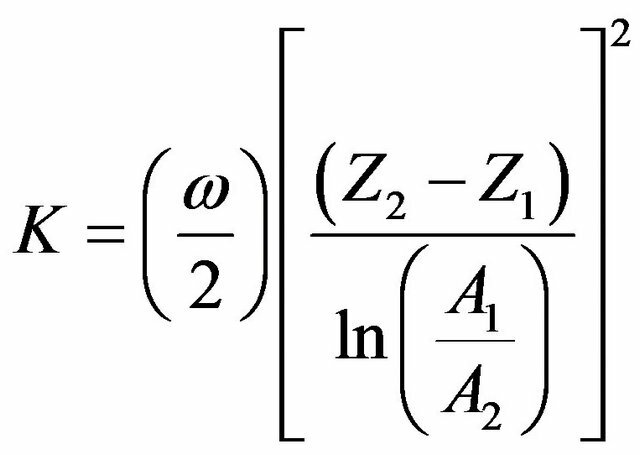 If the first two harmonics are sufficient to describe one boundary condition above the level Z = Z1 (Z1 = 0, the surface level), K can be calculated using Equation (6) of the arctangent method. where T1, T2, T3 and T4 are the soil temperatures recorded in Z1 and T’1, T’2, T’3 and T’4 are the soil temperatures recorded in Z2, at 0, 6, 12 and 18 hours . 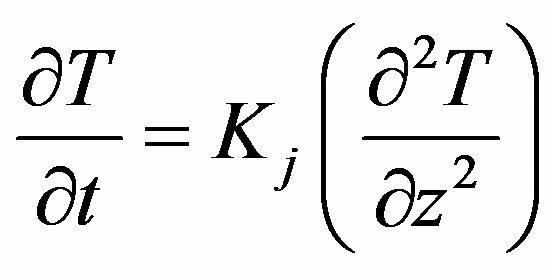 Using the same methodology of arctangent method, Seemann  demonstrated that K can also be calculated by Equation (7). The arctangent and logarithmic methods are analogous to the Amplitude method, but require a greater number of observations to approximate the behavior essentially non-sinusoidal . The soil thermal diffusivity values using the arctangent, logarithmic and phase methods were compared with the values obtained by the amplitude method. To evaluate these methods, we considered the mean absolute error (MAE; Equation (8)) and root mean squared error (RMSE; Equation (9)).The MAE indicates the distance (deviation) of the mean absolute values estimated from the measured values. Ideally, the MAE and RMSE values were near to zero . The RMSE indicates how the model fails to estimate the measurements variability around the mean and measures the change in the estimated values around the measured values . The lower limit of RMSE is 0, which means that there is full compliance between the model estimates and measurements. where Pi is the estimated value, Oi is the observed value and O is the average of the observed values.The multivariate analysis of variance test-MANOVA was used to determine possible differences between the methods for estimating the soil thermal diffusivity. The monthly rainfall was 138, 121, 320, 105 and 305 mm in October, November and December 2008, and January and February 2009, and the total accumulate drain fall was 989 mm during the study period (Figure 1). 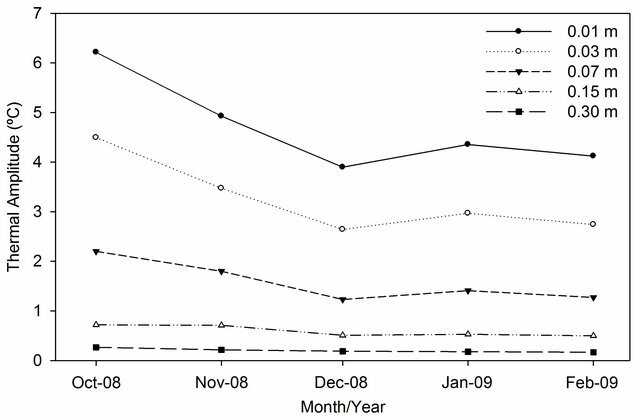 The volumetric soil water content (VSWC) increased from October 2008 to February 2009 (Figure 2) as a function of increased local rainfall (Figure 1). The largest amount of VSWC coincides with the wettest month, and the inverse occurs with the driest month. The highest VSWC occurred during February 2009, with 0.38 and 0.47 m3·m−3 at 0.25 to 0.05 m depth, and the lowest VSWC occurred during October 2008, with 0.15 and 0.30 m3·m−3 at 0.25 to 0.05 m depth (Figure 3). The average maximum soil temperature decreased from October to December, while the minimum soil temperature had less variation. The maximum soil temperatures increased from January to February 2009, but at a lower rate than October-December 2008, and also the minimum soil temperature values increased from January to February 2009 (Figure 2). The average maximum soil temperatures at 0.01 m depth were 32.8˚C, 31.3˚C, 29.6, 29.9˚C and 30.9˚C at 13 h, 13 h and 30 min, 15 h, 15 h and 15 h and 30 min in October, November and December 2008 and January and February 2009, respectively. The average minimum soil temperatures at 0.01 m depth were 24.0˚C, 24.1˚C, 23.9˚C, 23.7˚C and 25.1˚C at 6 h, 5 h and 30 min, 30 min and 5 h, 6 h and 6 h and 30 min in October, November and December 2008 and January and February 2009, respectively. The attenuation of the maximum soil temperature from 0.01 m to 0.30 m depth was 6.1˚C, 4.4˚C, 2.8˚C, 3.3˚C and 4.0˚C with a lag of 11 h 30 min, 10 h, 9 h 30 min, 9 h and 10 h in October, November and December 2008 and January and February 2009, respectively. 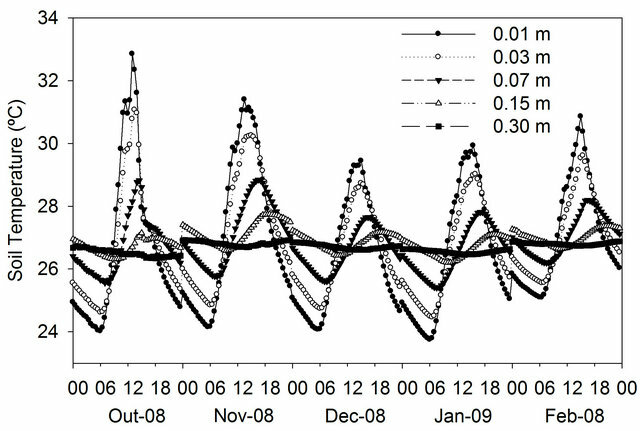 The soil temperature amplitude decreased from October to February (Figure 4), reflecting the increase of water content in soil, caused by increased rainfall over the period (Figure 3). The soil temperature amplitude reduction during the summer, during this work, is due the higher VSWC (Figure 3) that changes the magnitude of energy balance components, and modify the properties of soil heat conduction [17,18]. The water fills the soil pores, which contribute to increase heat flux and decrease soil temperature amplitude . Figure 1. 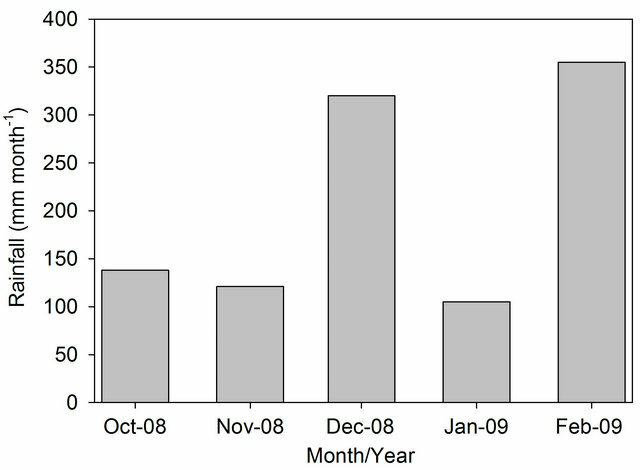 Monthly rainfall in the Brazilian Pantanal from October 2008 to February 2009. Figure 2. Mean monthly composite average of the diel soil temperature at 0.01, 0.03, 0.07, 0.15 and 0.30 m depth in the Brazilian Pantanalfrom October 2008 to February 2009. Figure 3. 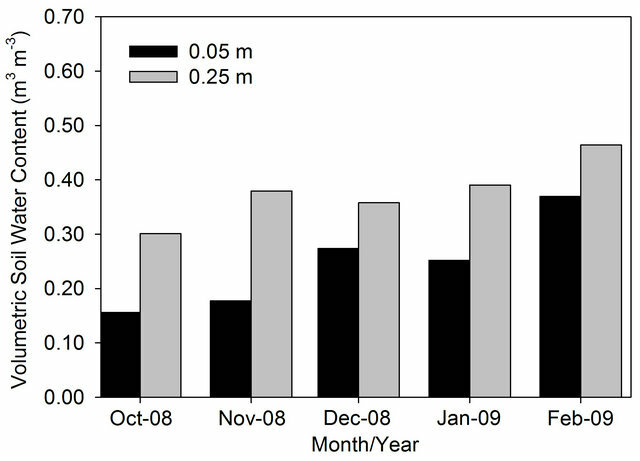 Monthly volumetric soil water content at 0.05 and 0.25 m depth in the Brazilian Pantanal from October 2008 to February 2009. Figure 4. Mean monthly soil temperature amplitude at 0.01, 0.03, 0.07, 0.15 and 0.30 m depth in the Brazilian Pantanal from October 2008 to February 2009.
soil is assumed that there is higher VSWC and it alters the soil specific heat and soil thermal conductivity. Thus, the soil heat capacity increases with VSWC increases due to the high water specific heat (4.18 MJm−3·K−1) . The highest average of soil thermal diffusivity estimated by the amplitude method was 1.95 × 10−7 m2·s−1 in November 2008between 0.01 and 0.15 m depth, and the lowest average was 1.02 × 10−7 m2·s−1 in December 2008 between 0.01 and 0.03 m depth (Figure 5(a)).The soil thermal diffusivity estimated by amplitude method is used as reference among all used models [5,20]. The soil thermal diffusivity values calculated in this study agreeto estimates by Oliveira et al. in Campina Grande (1.5 − 3.33 × 10−7 m2·s−1), Souza et al. in forest and pasture in Amazon (1.45 − 6.74 × 10−7 m2·s−1)and Rao et al. in Salvador (4.7 − 7.5 10 × 10−7 m2·s−1). The soil thermal diffusivity estimated by the amplitude method between 0.01 and 0.15 m depth was higher than soil thermal diffusivity between 0.01 and 0.03 and between 0.01 and 0.07 (Figure 5(a)). There was a tendency of increasing of the soil thermal diffusivity estimated by amplitude method as function of increasing of depth. Furthermore, the VSWC seems to be the main factor to regulate the soil thermal diffusivity because the average of VSWC during the studied period was 0.24 m3·m−3 at 0.05 m depth and 0.37 m3·m−3 at 0.25 m depth. The highest average of soil thermal diffusivity estimated by the logarithmic method was 2.47 × 10−7 m2·s−1 in December 2008 between 0.01 and 0.03 m depth, and the lowest average was 1.87 × 10−7 m2·s−1 in January 2009 between 0.01 and 0.07 m depth (Figure 5(d)). The soil thermal diffusivity estimated by the logarithmic method also showed a tendency of increasing as function of increasing of depth, with higher values of soil thermal diffusivity estimated by amplitude method. The soil thermal diffusivity estimated by phase (Fiure 5(b)) and arctangent(Figure 5(c)) methods showed similar dynamic, with decreasing from October to December 2008, and increasing from December 2008 to February 2009, and values were overestimated in relation to the amplitude and logarithmic methods (Figures 5(a) and 5(d)). The soil thermal diffusivity estimated by arctangent method was higher in October 2008 (5.38 × 10−7 m2·s−1) when the VSWC was lowest. The soil thermal diffusivity estimated by phase method was higher in January 2009 (3.55 × 10−7 m2·s−1) when the rainfall was lowest. The VSWC is an important factor to regulate the thermal process in the soil. The soil thermal diffusivity can be higher or lower as function of VSWC [18,23]. The increasing of VSWC becomes the soil thermal conductivity higher, because the water that replaces the air in the soil pores has higher thermal conductivity . There were differences in the structure of each layer of soil studied (Figure 6), which influence in water retention, for example, the clay retains more water than the sand interfering in soil thermal diffusivity variation . There is a maximum value to soil thermal diffusivity at a determined VSWC, while the volumetric heat capacity continues to increase with increasing VSWC . Figure 5. 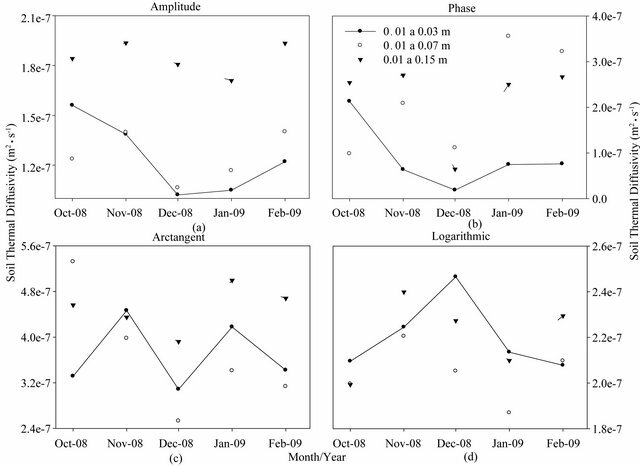 Mean monthly soil thermal diffusivity estimated by the amplitude, phase, logarithmic and arctangent methods between 0.01 and 0.03 m, 0.01 and 0.07 m and 0.01 and 0.15 m in the Brazilian Pantanal from October 2008 to February 2009. Figure 6. 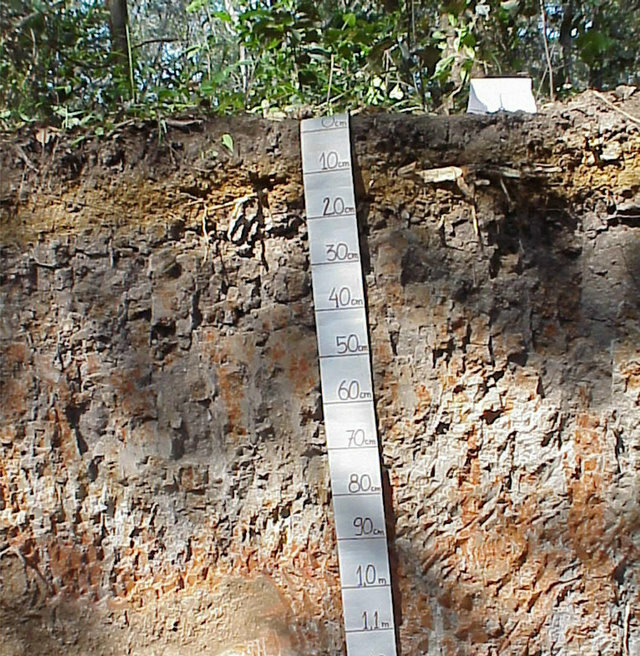 Soil profile of the study area in the Brazilian Pantanal, 2009. Table 1. Mean absolute error—MAE, root mean squared error—RMSE, Pearson correlation coefficient—r for soil thermal diffusivity estimated by phase, arctangent and logarithmic methods between 0.01 and 0.03 m, 0.01 and 0.07 m and 0.01 and 0.15 m depths, taking as reference values estimated by amplitude method in the Brazilian Pantanal. thermal diffusivity of soil have been made to different locations and specific depths [4,12,22,26,27]. However, they were restricted to describe the soil thermal diffusivity values estimated by the methods studied in this work. The normality of the soil thermal diffusivity was checked and was applied MANOVA statistical test to evaluate if there were differences between the estimates of soil thermal diffusivity at each depth at 5% probability. The soil thermal diffusivities estimated by the methods of amplitude, phase, and the logarithm of the arctangent differed (p < 0.05) and varied over time (Figure 5). Using the soil thermal diffusivity estimated by amplitude method as reference was computed mean absolute error-MAE and the root mean squared error-RMSE between phase methods, arctangent and logarithmic. Among the three methods the phase method showed lower EMA between 0.01 and 0.03 m depth and the logarithmic method showed lower RMSE between 0.01 to 0.15 m depth. The phase method showed higher correlation (r = 0.81) between 0.01 and 0.03 m depth, followed by logarithmic method (r = 0.62) between 0.01 and 0.07 m depth and (r = 0.61) between 0.15 to 0.01 m depth, while the arctangent method showed no significant correlation (Table 1). The soil thermal diffusivity estimated by the four methods showed significant differences (p < 0.05) and varied over the study period as a function of water content in the soil. Even the methods to estimate soil thermal diffusivity are significant different the methods of phase, logarithmmic and arctangent were significantly correlated to the amplitude method. The method of estimation of the soil thermal diffusivity that showed better performance at different depths was the logarithmic method, followed by the phase method with the highest correlation to lowest depth. The estimation of soil thermal diffusivity by phase method showed lower mean absolute error to less depth, while the logarithmic method showed lower mean squared error to greater depth. Thisresearchwassupported in partby Universidade Federal de Mato Grosso (UFMT), Conselho Nacional de Desenvolvimento Científico e Tecnológico(CNPq), andfromlogisticalsupportfromtheReserva Particular do Patrimônio Natural (RPPN) ofthe Serviço Social do Comércio (SESC)-Pantanal.The authors thank Vicente Bellaver (in memoriam) for help with field sampling and soil laboratory analysis. M. N. Castelnou, D. Floriani, I. A. Vargas and J. B. Dias, “Sustentabilidade Socioambiental e Diálogo de Saberes: O Pantanal Mato-Grossense e Seu Espaço Vernáculo Como Referência,” Desenvolvimento e Meio Ambiente, Vol. 7, 2003, pp. 41-67. V. H. M. Danelichen and M. S. Biudes, “Avaliação da Difusividade Térmica de um Solo no Norte do Pantanal,” Ciência e Natura, Vol. 33, No. 8, 2011, pp. 227-240. C. C. L. Beber, “Difusividade de Solos do Tipo Latossolo Vermelho em Função do Teor de Umidade,” M. Sc. Thesis, Universidade Regional do Noroeste do Estado do Rio Grande do Sul, Ijuí, 2006. E. R. Schöffel and M. E. G. Mendes, “Influência da Cobertura Sobre o Perfil Vertical de Temperatura do Solo,” XIV Congresso Brasileiro de Agrometeorologia, Piracicaba, 18-21 July 2005, pp. 1-2. M. S. Biudes, J. S. Nogueira, H. J. Dalmagro, N. G. Machado, V. H. M. Danelichen and M. C. Souza, “Mudança No Microclima Provocada Pela Conversão de Uma Floresta de Cambará em Pastagem no Norte do Pantanal,” Revista de Ciências Agro-Ambientais, Vol. 10, 2012, pp. 61-68. J. E. M. Pezzopane, G. M. Cunha, E. Arnsholz and M. Costalonga, “Temperatura do Solo em Função da Cobertura Morta por Palha de Café,” Revista Brasileira de Agrometeorologia, Vol. 4, No. 2, 1996, pp. 7-10. R. C. Santos, “Propriedades Térmicas do Solo: Um Estudo de Caso,” M. Sc. Thesis, Instituto Nacional de Pesquisas Espaciais, São José dos Campos, 1987. T. O. A. Pessoa, “Avaliação da Influência da Mineralogia, Índices de Vazios e Teor de Umidade em Propriedades Térmicas,” M. Sc. Thesis, Pontifícia Universidade Cató- lica do Rio de Janeiro, Rio de Janeiro, 2006.